We all want a room in our home where our family gathers to watch a movie, play games, chat about our day and enjoy time together. This room can have features such as a fireplace, a television, and lounging area. But most important it needs to be inviting, a place you want to hang out. Our family room was anything but a place I wanted to hang out. The carpeting was filthy, the walls colors were dreary, and there was wallpaper on one wall featuring rocks, and the coffered ceiling was bland and boring. 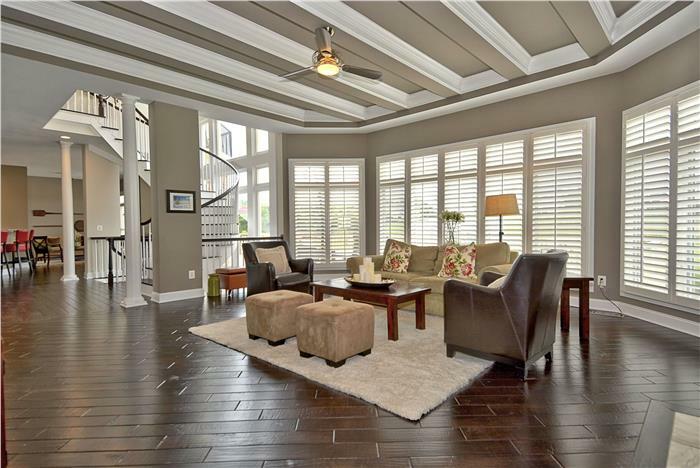 The positive features of the room were the plantation shutters, the size of the room and the coffered ceiling. These features were lost in the way the room was styled. Highlighting the beautiful features of the room was where this project began. In keeping with the new hardwood floors we installed in the other rooms of the house, we added 5″ maple dark hand scraped hardwood floors on a diagonal to this room. We removed the wallpaper and painted the room a greige, a gray beige. We installed small stone tiles around the fireplace surround to add more color to the room. By accentuating the coffered ceiling using 2 tone paint colors, it really added to the warm feeling of our family room. A cozy soft area rug, and a couple cube ottomans and leather chairs filled out the large space. A unique 3 bladed fan was a cool feature for the ceiling and an oversized clock was the perfect addition for the fireplace. What do you think, leave me a comment. Thanks for stopping by.